Receives repository updates from the client. Pushes repository updates to the client. Pushes a repository archive to the client. Besides those built-in commands, an administrator can also provide it’s own commands via shell scripts or other executable files. As those are typically completely custom, this post will concentrate on the built-in ones. Note: This has nothing to do with the also recently fixed vulnerabilities in gitlab  . If you are familiar with git, you’ll maybe know that most of the servers encapsulate the git protocol inside additional protocols like SSH or HTTP/S . That’s because the git protocol itself, while being a simple text based protocol , does not provide any authentication or protection mechanisms for the transferred data. The most common choice for write access to a repository is SSH as it provides multiple authentication mechanisms, a stable encryption, low protocol overhead once established and is widely approved. The downside of using SSH is that it was primarily designed to provide a shell access to remote users (“Secure SHell”). Typically, one does not give that to git users. To restrict the connection to be used only for accessing repositories, one has to replace the original shell (typically bash or something similar) by another, more restrictive shell. Big hosting companies often implemented their own version which mimics the commands listed above. But it is also possible to use the shell provided by the git developers, which restricts you to use only whitelisted commands and calls them accordingly. The setup is fairly simple. The recommended way is to create a dedicated git user on your server and use the git-shell command as the login shell for that user . Another option is to use so called SSH force commands, which allows you to decide on a per client base (depending on the used key during authentication), but more on this later. If both repositories have the same commits. If you try to execute commands which are not in this whitelist (either the builtin commands listed above or inside of a git-shell-commands directory in the home directory) you’ll get an error that this command is not recognized. Typical command injection attacks also do not work, as there is no interactive shell used. Instead the command line is simply split by spaces (but respecting quotes) and used by execve. 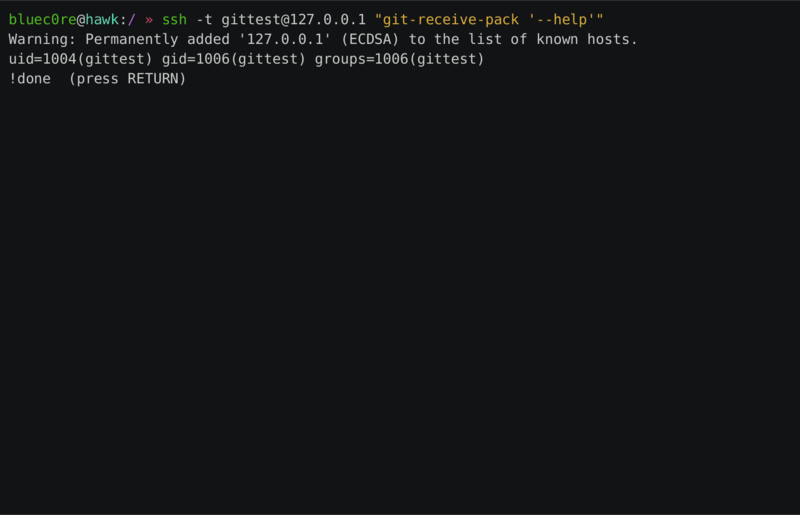 $ ssh git@remoteserver "git-receive-pack '--help'"
Neat! But how does this help us to bypass the restrictions? On most systems, if you open a man page (by the man command), the man specification is parsed, rendered to an ANSI output and piped into a pager (most of the time the less command). This allows you to scroll and search within the main page, independent of your terminal size and capabilities. 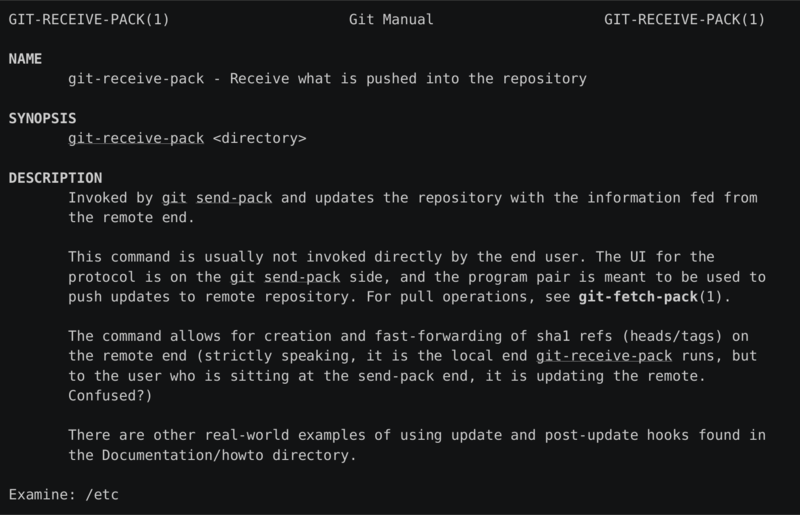 $ ssh -t git@remoteserver "git-receive-pack '--help'"
Nice! We are now able to use all interactive features of less :-). In the recommended setup there is, however, one restriction. As I said before, the shell execution feature tries to execute commands in the current shell. This is the git-shell in our case, therefore we have the same restrictions here as if we had with the commands specified over ssh. Nevertheless, we are able to read files, list directories (by (ab)using the tab completion) and write the current shown output to a file (which might help us further if we are able to control a part of the output). But as you might remember from the beginning of the post, there is also a second method to use git-shell (although not that common, as far as I can tell). This could for example be used if you want to restrict only a subset of the users with access to your hosted repositories, or if you are not allowed to change the shell for your git user (e.g. in a managed environment without root access). But it has to be noted here, that you are able to supply additional (optin) flags to the forced command which restrict the ssh features. The most notable flag is the no-pty flag . This prevents clients from requesting a pty and therefore does not allow to run less in an interactive mode. I recommend to update to one of the fixed versions v2.4.12, v2.5.6, v2.6.7, v2.7.5, v2.8.5, v2.9.4, v2.10.3, v2.11.2, v2.12.3 or v2.13.0. Yes of course. My point was that it’s not often that you have that access to whatever git server it is that you’re using. Thus utilizing it in this case opens up the network(s) available to that git server itself to you. Useful from a red team / pentesting perspective. I execute ssh root@server “git-receive-pack ‘–help'” and the whole help message is send me back, no pty. But i don’t set “no-pty” in config file, why I cannot perform vulnerability? Hello,I found your References is contains the site gitlab.com release security issue ,but i didn’t find about the Related problem,is gitlab-shell is effect?